Founded in 2001 by experienced attorney Marlon Branham, the law firm is dedicated to providing the highest level of service possible for those in need. Throughout the course of its history, the firm has helped countless clients assert their rights and secure the compensation they need following an injury or loss caused by another party's negligence. Additionally, families throughout the region have turned to the firm for help with their tough and emotional domestic relations issues, including divorce and child custody and support matters. Moreover, the law firm has advocated on behalf of numerous clients needing assistance with immigration and has achieved favorable outcomes for those facing serious criminal charges. 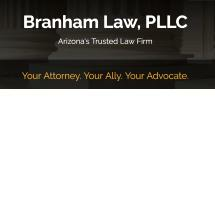 Any Arizona citizen who needs dependable, competent legal counsel related to any of the firm's practice areas can contact Branham Law Offices, P.C., to schedule a free initial consultation with one of the firm's dedicated and experienced attorneys.